A brisk sunny morning has dawned on Januuary 27th, 2018, when the Serbian Church liturgically commemorates the greatest enlightener and the First Archbishop of Serbia, Saint Sava. In Saint Sava’s Parish of Los Angeles, created through equal to the apostolic efforts of Saint Sebastian Dabovic in 1909, final preparations for the celebration of the one who, for centuries, has been teaching and inspiring Serbs all around the globe how to remain on “the path that leads to Life” (according to his troparion), were being executed in haste. Saint Sava of Serbia and all Orthodoxy, as the true “Homo Univesalis” (Universal Man), or we can rightfully use the term “The All-Man” (St. Justin of Celije used this term when speaking of Dostojevski), has once again manifested his universality and all-inclusiveness, gathering together in the temple dedicated to him in San Gabriel near Los Angeles, in love, beauty and majesty (Ps. 132:1) brothers and sisters of various nationalities and clergy representatives from different Orthodox jurisdictions. This all-inclusiveness and universality of his, comes as a result of his lifelong efforts to emulate The God-Man Christ, opening himself for the Holy Spirit, joyfully submitting himself the His Holy Will, as well as from his humble and sacrificial service to the Church of God. The Liturgical Synaxis was presided by our father and the Bishop of the Western American Diocese, His Grace Maxim, with concelebration of the most dear and esteemed guest, His Grace Kirilo Bojovic, Bishop of Dioclea, who, day before, arrived from Argentina. His Grace Bishop Kirilo is a Vicar Bishop to Metropolitan Amfilohije of Montenegro and Littoral, with whose blessing he oversees the institution and development of new parishes in the Diocese of the Central and South America of the Serbian Orthodox Church.These two esteemed Hierarchs were assisted by the representatives of the local presbyterium: Fr. Nikola Ceko (Episcopal Chancellor),Fr. Lazar Vasiljevic, Fr. BlaskoParaklis, Fr. Norman Kosanovich, Fr. John Mahfouz (Antiochian OC), Fr, John Tomassi (OCA), Fr.JosephRassam (OCA), Fr. VasileIlie (Romanian Parish OCA), Predrag Bojovic (Parish Rector), Deacon Vladan Radovanovic and Deacon Jovan Katanic.This Liturgical Celebration was also attended by Abbes Silouana with her sisters from a nearby Monastery of St. Macariusthe Great of Egypt (OCA) as well as by Abbess Parasceva from the Diocese of Banat of the SOC. “There shall be one fold and one shepherd.” (John 10:16) are the concluding words of the Gospel reading for this day but also the words with which His Grace Bishop Maxim began his inspiring Hierarchical Sermon to the flock of the faithful God has entrusted him with. Following the Holy Eucharist as an Icon of the Kingdom of the “Things to Come”, but alsoit’s foretaste and realization “here and now”, in which many children and adults partook, a procession around the church led by children and a festal banquet, for approximately 350 attendees, took place. 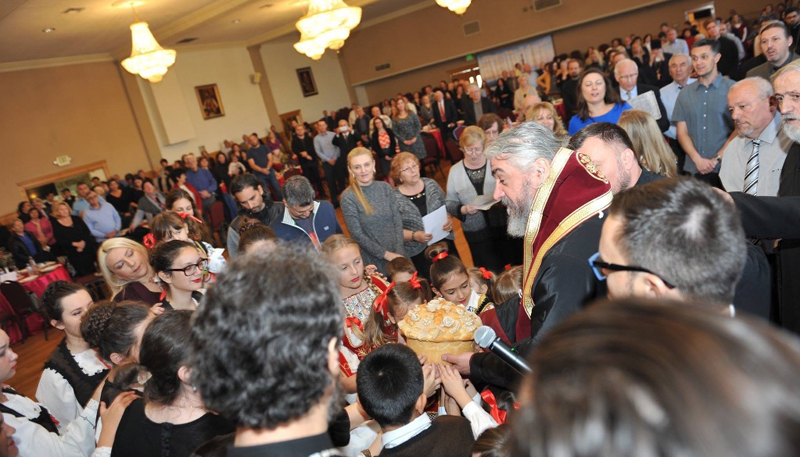 At the beginning of the banquet His Grace Bishop Kirilo blessed the Slava Bread and Wheat, breaking it, in accordance with the “slava” tradition, with this year’s slava hosts Dejan and Ljiljana Miskovic, encircled by the joyful youth of this Parish. At everyone’s joy and pleasure a wonderful recital and program was performed by the Sunday School children of this Parish. It was their humble offering to Saint Sava, from their talents and time, and a token of appreciation for all the blessings he bestowed upon us. Immediately following the program, a festal banquet, prepared by the local KS Sisters, was served and enjoyed by everyone. After expressing gratitude to Bishop Maxim for leading us in our joint movement toward The Kingdom, as well as to all the participants, Fr. Predrag Bojovic announced, with a few well-chosen words, the central address of Bishop Kirilo Bojovic, reminding everyone of the fact that Serbian Church has already had, almost a century ago, an esteemed Bishop from the Bojovic Family. It was Bishop Jeferm Bojovic of Zicha of blessed memory, a sibling of the well renowned General and Vojvoda Petar Bojovic. In his address, speaking of Saint Sava and our inabilities even to begin “to proclaim all his good deeds” (according to the words of the vesperal hymn), Bishop Kirilo meaningfully tied it in with a Mission of the Church in South and Central America, since that mission is, in fact, only the continuation of the St. Sava’s God-pleasing works in cares for the spiritual well-being of the Serbian people, but also a living testimony of the Resurected Lord amongst the heterodox.